It’s tough to get excited by yet another Japanese restaurant in Hong Kong, especially one lacking the authenticity of a Japanese head chef. Still, not being Japanese didn’t inhibit restaurateur David Chang and the worldwide success of his Momofuku restaurant group. 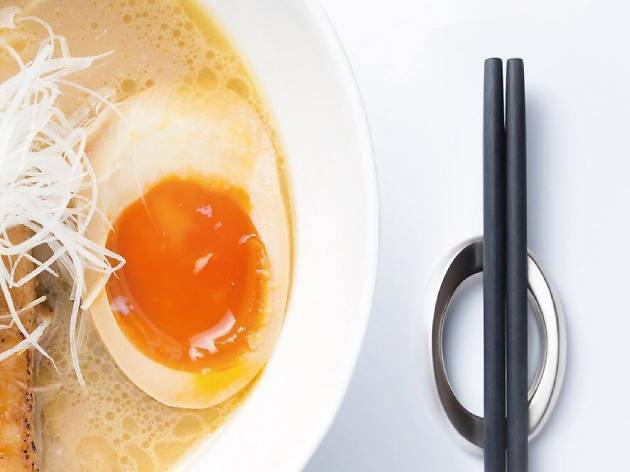 Thus we leave our reservations at the door (no pun intended) when visiting Fuse Creations, a specialist in modern Japanese cuisine founded by Hongkonger Simon Lee, a man inspired by Momofuku who then honed his ramen craft at Eureuka Labs and Yamato in Singapore. By the entrance sits a noodle kitchen where the restaurant’s ramen noodles are made in-house, as is Fuse’s motodare, the main flavouring agent in ramen soup. Impressed, we settle in and immediately order this signature dish, opting for the Fuse ramen with thick pork stock (shoyu motodare blend), char siu, yakibuta roast pork, soy infused egg, leek and nori, and the cream of chicken noodle, which uses a thick chicken stock mixed with a shio motodare blend. Both are wonderfully umami-laden and the noodles are satisfyingly chewy. Both the char siu and yakibuta cuts are melt-in-your-mouth soft, with a perfect meat-to-fat ratio. These are some of the best ramen we've had in a while, with the former standing out in particular. Still hungry – the portions of ramen are smaller than many big bowls found around town – we also order the miso cod with sautéed spinach vene cress, baby shiso and a squid ink tulle as well as ‘mash and egg’ – chicken leek mashed potato with a slow poached egg and topped with crispy wonton and chicken skin. The cod is nicely cooked and beautifully plated, slightly translucent and flaky; the little blobs of white miso and tulle are commanding flavours, delicious in their own right, but they enhance rather than overwhelm the fish. The creamy mash, when mixed with the egg, is ridiculously indulgent. It’s buttery, salty and there’s a cheeky crunch provided by chicken and wonton skins. Usually, any Japanese restaurant worth its salt specialises in one area, be it ramen, sushi, yakiniku or something else. 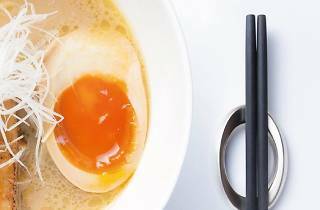 We love the passion that goes into the dishes at Fuse and the restaurant succeeds despite dividing its attention between ramen and well presented, contemporary-style mains. We commend Lee for thinking outside the box, especially since the results are as delicious as they are here. Hong Kong MTR Station, exit C.